After testing out the Sanyo Taho, I'm somewhat disappointed by the features and performance. It wasn't quite as durable as I would have expected and I wish it had more features for those who are outdoors than what it ships with, perhaps a compass or pedometer. Battery performance was also disappointing. If you aren't planning on being too terribly rough with your phone, then the Taho should be fine. The Sanyo Taho by Kyocera is one tough phone, but it gets the job done in other ways as well. Good call quality and battery life make the Taho attractive to the average user, while some nifty enterprise tools make the Taho a good choice for businesses. This phone isn’t going to sell a ton, but if you’re in the market for a good, durable phone and don’t care too much about messaging, web and similar features, the Taho is certainly worth a serious look. The hardware is mostly good, though I wish the dialpad buttons were a little easier to differentiate. The menu system and feature set are as basic as it gets, with little in the way of extras that could make using the phone enjoyable. Making calls is a snap, as is pecking out text messages, but it's criminal that users have to search for and download email and IM clients from Sprint's crummy portal. Lacking even the most basic social networking features leaves this phone out of the modern era. It's a device straight from 2004. There is no multimedia playback available on this device, and the camera and camcorder perform so badly, they are hardly worth using. Would I recommend the Taho? Only to the outdoorsy types who use a phone for nothing but phone calls. Anyone else would be better served by one of Sprint's less-featureless flip phones. As the Vero is nothing much more than a phone we were hoping for great call quality and it delivered. Callers rated us an 8.5/10, saying that we sounded very good with no echoing, no excessive background noise and great overall clarity. They sounded very natural to us with good tone reproduction and overall quality. The battery is rated at 5.2 hours of talk time, which for the target audience is probably about all they’ll talk in a month. Ours sat in standby mode for several days before needing a recharge, so for the average user charging it two times a week should be quite ample. Call performance on the Sanyo Innuendo was fairly good. Callers sounded much more natural than we’ve come to expect from Sanyo phones. They were loud and clear, an 8/10 on our end. We found similar feelings on the other end as callers also rated us 8/10, saying that we sounded pretty much ok but if they had to pick something we were a bit hollow. 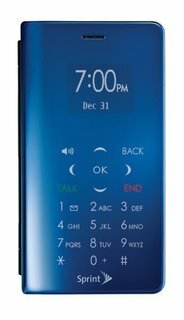 Battery is a mere 4.5 hours, which will get almost anyone through the day but well below what modern CDMA featurephones are getting. 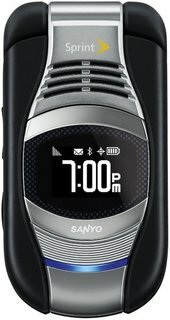 One thing Sanyo does do consistently well is phone quality, and the Sanyo Incognito SCP-6760 keeps this tradition alive. Callers were very impressed with how clear we sounded, giving us a 9/10 rating. They sounded very good to us as well, voices were natural and the volume was good. The battery is rated at 5.1 hours, a bit below the Reclaim’s 6 hours, but standby time is excellent and our device went for more than a week without needing a charge. In the end we just couldn’t get into the Incognito. It’s an EnV2 knockoff, two years later. The hidden keypad is unique, but not extremely functional. The QWERTY isn’t the easiest to use, and similar devices like the LG Lotus and Samsung Reclaim are much more comfortable to type on. Phone performance was a lone bright spot, and an important one at that. We can see some users picking it up for the form-factor, but in our opinion they’d do better to choose the Samsung Reclaim. For what it is, the 2700 covers the basics of messaging and phone functionalities well. Its target customer - pre-teens, Tweens, young teens - will be happy with how easily they can keep in touch with t heir posse via SMS, IM and emails. They'll also appreciate the smaller size of the phone and the relatively good looks. What they may miss, however, is a lack of good social networking services, such as Facebook or MySpace. People looking for even slightly more advanced features, such as a music player, video capture and 3G web browsing, will be sorely disappointed, as none of them are present. The people most likely to buy this phone (or have it bought for them) will appreciate its virtues, and probably won't miss what it doesn't have. It's a good first phone for the kid who wants to reach out and message someone. Seasoned users may find it a bit too simplistic. 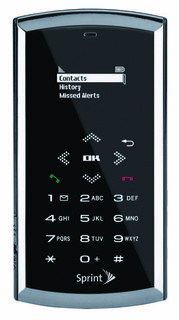 The inside of the Eclipse X features a large keypad with with rectangular keys that seemed a bit stiff during use. The phone offers dedicated back, speaker, and camera buttons, but it should be noted that none of the keys located around the d-pad cluster can be read in the dark, even when the backlight is on. That makes the phone a bit harder for novices to use when the lights go down. In terms of call audio, the Eclipse seemed a bit muddled during our test calls and wasn't as clear as we had hoped. The speakerphone, on the other hand, provided us with audio that was easily as good as we heard on non-speakerphone calls. 3G browsing data rates on the Eclipse X were fairly slow, typically coming in at about 350Kbps. But the Eclipse's browser performed poorly not only in speed, but also did not format sites correctly, even many mobile specific sites. Overall we found Sprint's Katana Eclipse X quite enjoyable in terms of aesthetic features, like the ultra cool lighting effects and quick access to media related functions. But under its hood, the Eclipse seemed to fall short of the mark. Sanyo's newest weapon in the mobile phone wars has a decidedly old-fashioned design. Looks aside, it's a passable multimedia phone: The interface is efficient, and built-in GPS serves up turn-by-turn directions that beat static, collision-inducing Google Maps. Support for Sprint's TV and music services means you'll never be bored at the DMV again. It also comes in pink, if that's how you roll. WIRED: Easy-to-carry, 0.6-inch-thick design. Sharp QVGA screen. Sensible button layout. Keys have nice bounce. Included 128-MB microSD card is better than nothing. TIRED: Kinda fugly. Uninspiring build quality. Mediocre 1.3-megapixel camera. No external music controls. Rather pricey considering what you actually get. Don't buy a Sanyo!!! They treat their customers like Crap!! Best cell ever had !!! 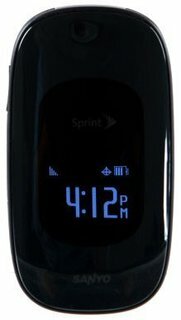 Bought this cell phone from sprint in 2007 and it is still working like new. It still has its original battery and I have drop it hundreds of time and it bounces like a rubber ball. Screen display failed shortly after purchasing. My cell service provider sent the phone away for warranty repair. Sanyo said no warranty. Pay $140+ and they will fix the phone. The phone was returned not repaired. This is the last Sanyo phone I ever buy. I have several coworkers with the same phone all with the same problem. Visit the Sanyo Q&A Forum to get answers, ask a question or help others.